The first Christmas after my husband died, I went to Arizona with Audrey and my parents to stay with family. “Do something different,” seemed to be the advice we got. I moved around in a sort of daze then; the pain was the same whether amongst the desert cacti or back home in the snowy Northeast suburbs. On Christmas Eve we attended a party at a cousin’s, and I found myself outside on the patio where a lot of the refreshments were, when my little barely two-year-old, sitting near a Christmas tree in a red knit dress, excitedly talking to my parents, caught my eye through the glass window of the house. I walked over to the window. Audrey likes to say her dad sees her at important moments through “the window in heaven.” That night, I too was observing from heaven’s window. The whole scene seemed to be taking place in another dimension; the noise of the party on the patio behind me muted as I stepped up to the window with the tears that constantly seemed to sit in my eyes starting their silent descent. I was an unseen observer looking in at a life I felt entirely disconnected from, yet through that pane of glass was all of the beauty and pain of my past, present, and future in one silent, moving scene. In that crystallizing moment, I saw the remnants of my life—a beautiful toddler at Christmas—and even as I grieved for her loss, and mine, I understood—that, right there, is my life now. Last December, a few days after Christmas, I went out to our porch to plug the outdoor Christmas lights in for the night one evening, when I caught a glimpse through my own window pane. I stood still, befriending the cold air. From behind the Christmas tree branches in the corner of our living room, I saw my daughter playing the piano, her head tilted slightly to the side in concentration. I could hear the notes just faintly. She did not see me. The house was warm and serene inside. It was a beautiful scene to me, so beautiful that I took a photo to try to capture it. I stood there for many minutes, time intersecting with the December five years earlier—meeting at Eliot’s “still point”—not linear time, but the physics notion of block time. I stood with her, the grief-stricken young mother, 34, in the desert at Christmas. ** I share with you these two window pane memories because they offered me a transcendent moment to step outside of my own life and see it from another perspective. I did not have to travel far to see a vastly different point of view. If you are starting to make resolutions for the new year (I do not), here is a good exercise, if not a resolution: stand outside of your home and peer in through a window every now and then, preferably when there are people you love inside. You may be surprised at what you see there, looking from the outside in. This is such a beautiful idea! Whenever I can see into other people’s homes through their windows at night, I am always overcome by that feeling of sonder. I wonder what will happen when I peer into my own windows, taking in my life as an outsider would. In more meditative times I envision myself flying up above my home and seeing my life literally from above. It usually offers me a wider a perspective on situations I’m grappling with. I never thought of physically stepping outside my home to try and see a similar thing. Thank you for sharing these two stories with us. I seem to recall the blog post you wrote over at “Dear Miss Audrey” about that first Christmas in Arizona. It’s amazing to read it again here, retold with more distance between you and the actual unfolding of that time. Set against the story of last December on your porch and the photo that accompanies it… it’s hard to explain, but the whole thing left me with goosebumps combined with peace. Thank you for that. Thanks, as always, for reading and sharing your own experience. It feels like yesterday I experienced and wrote that first post. I liked it. It’s beautiful. Thank you. When we lived in a residential area of a major city, I liked to walk our dog after sundown in the winter and peer (in a non-creepy way, I hope!) in the brightly lit windows of houses both humble and grand. It was a comforting feeling, realizing our home was surrounded by all these other homes with people/families living their lives. 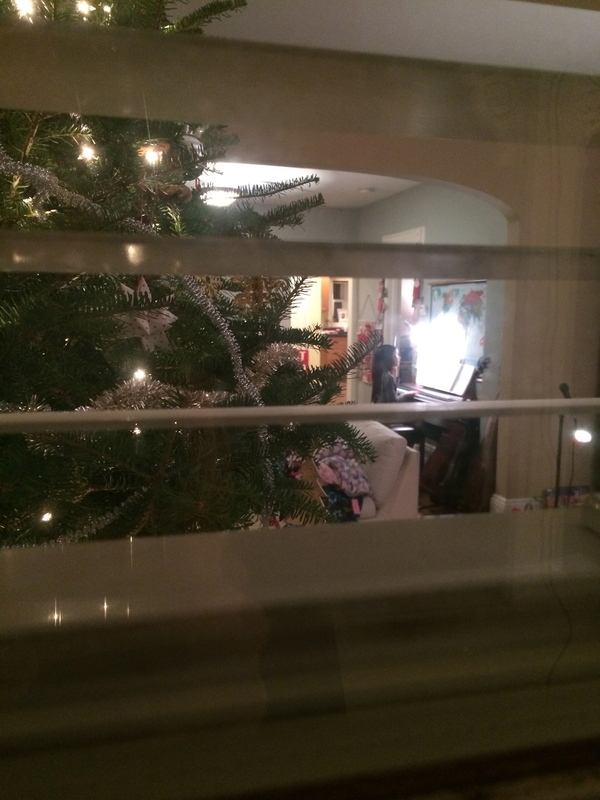 Love the photo through your window, Julia… it’s precious, with Audrey immersed in her music. Thanks for sharing these memories and such refreshing perspective. I can already imagine my heart being filled with gratitude and joy. Thanks for reading! Merry Christmas! Oh, these are such beautiful and tender stories. I love the idea of what you might find when looking in. I’ve caught glimpses of our house a few times lately, noticing the warm inviting light of the family room, the colors of the walls, but I haven’t seen my people within. I will be looking. Thanks for reading them Dana. Hope your book is coming along well. Oh how I wish I could read your writing everyday. Your words always sort of lift me up. Thank you. This was a precious encouragement to me- thank you.